No one was given the right to humiliate anyone. Having a higher social status doesn't justify your words nor your actions. 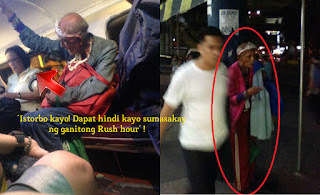 A concerned citizen has lost her temper after witnessing a poor senior citizen insulted by the jeepney driver's wife. 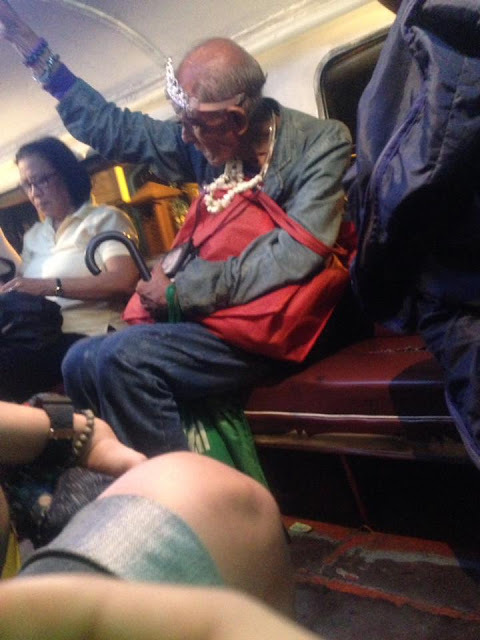 It was during the rush hour when this poor old man who looks like a beggar rode the passenger jeep. 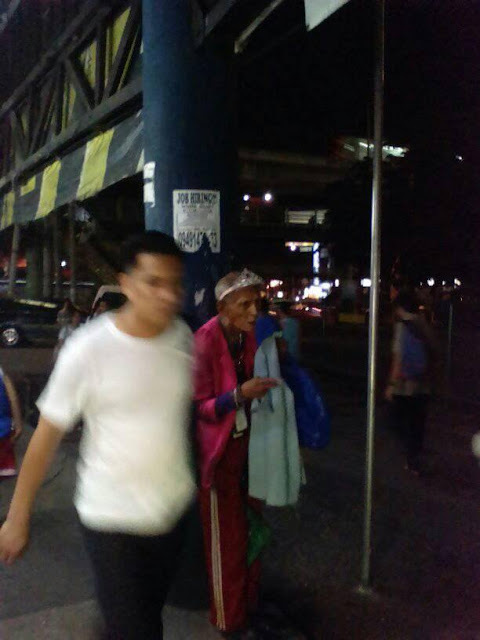 A lady named Renzel Lopez Sobrepena, who is also a passenger on the said jeep witnessed first hand an old man humiliated by the woman beside him. Renzel posted her enraged narration of everything happened. She was so pissed that she couldn't control herself and told the woman to stop harassing the poor man. Here's the screenshot of her post. The man sitting beside Renzel couldn't help it also and said "Pumapatol sa matanda". Referring to the woman. 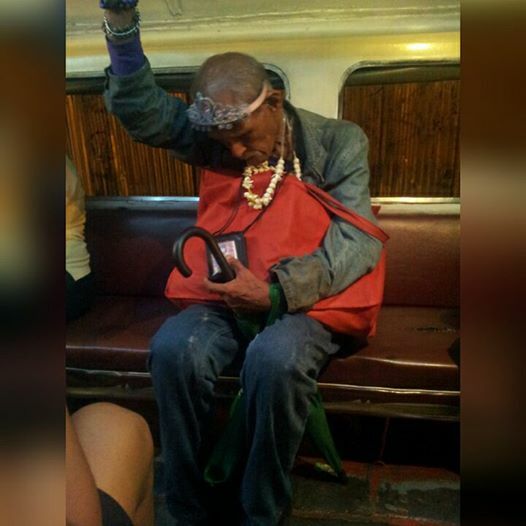 Renzel, paid the fare of the poor man, Suddenly the driver stopped the jeep at 5th ave. and told him to get down. A teenager sitting next to her also spoke up. 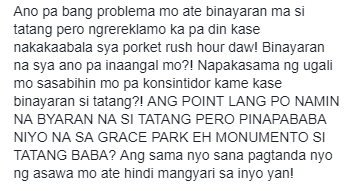 "Wala pang Monumento Kuya, binayaran naman siya ni ate ha!" 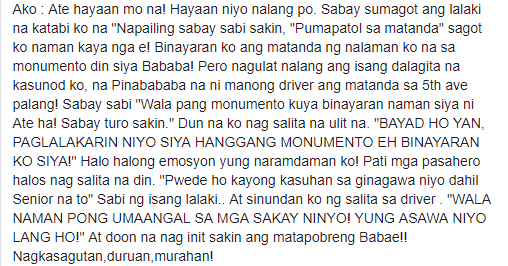 Renzel then spoke up, "Bayad ho yan, paglalakarin niyo hanggang Monumento, e binayaran ko na siya." she exclaimed. 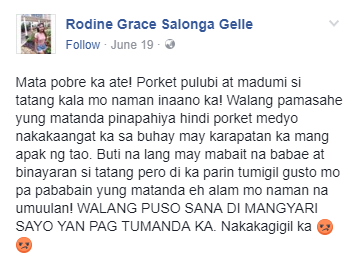 Other passengers also reprimanded the woman, "Pwede ho kayo kasuhan sa ginagawa niyo dahil Senior na to!" Renzel then answered, "Wala naman pong umaangal sa mga pasahero ninyo! Yung asawa niyo lang ho!" We all get what we deserve. Karma will come to get us. Be human, act like human! What do you think about this incident?